Plasma glucose levels: The American Diabetes Association reports that the fasting plasma glucose (FPG) for normal individuals should be <100 mg/dL. Here fasting is defined as no caloric intake for at least 8 hours (usually implying overnight fasting). Approximately 2 hours after a meal plasma glucose levels should be less than 140 mg/dL. The diagnosis of diabetes requires fasting glucose levels greater than 126 mg/dl on two occasions. Blood is drawn from the vein following overnight fasting (for fasting blood glucose levels) or at any random moment during the day (to measure random glucose levels). There may be some bruising, infection, and soreness at the site of puncture for drawing blood. The subject may also feel some dizziness. Oral Glucose Tolerance Test (OGTT) is an elaboration of the blood glucose test that reveals how the body metabolizes glucose ~2 hours after ingesting glucose. For pregnant mothers with high risk of diabetes, a glucose-screening test (OGTT) is usually performed between 24-28 weeks of pregnancy (or earlier) to identify gestational diabetes and manage the blood glucose levels for the health of mother and baby. After blood is drawn, the subject is asked to drink a liquid, which contains 50, 75, or 100 grams of glucose. Normally the absorption of glucose in the body occurs rapidly, and blood glucose levels rise within 30 to 60 minutes of fluid intake. Blood work is done an hour after drinking the solution. If the blood test shows abnormal blood glucose levels, then blood work must be repeated after three hours. The blood test may cause side effects such as moderate pain, nausea, and faintness. Drinking the glucose solution may cause symptoms like shortness of breath, nausea, and vomiting, particularly in pregnant women with a predisposition to gestational diabetes mellitus. Hemoglobin A1c (or Hb A1c or A1c)refers to the percentage of glycated hemoglobin present in the blood. Prolonged exposure to high blood glucose levels leads to glucose attaching itself to proteins including hemoglobin. Since this happens over a period of time and is irreversible - the HbA1c test is not affected by random fluctuations due to temporary alteration in diet, lifestyle, stress or illness of the subject. Maintaining an HbA1c below 5.7% is indicative of normal health. An HbA1c level of 5.7-6.4% signals prediabetes, and any values higher than 6.4% indicates a diabetic condition requiring treatment. A sample of blood is taken either from a finger stick or by drawing a small vial of blood from a vein (venipuncture) and is tested. Obtaining a blood sample for the test may lead to light-headedness or fainting of the subject. It may also lead to infection, excessive bleeding, or hematoma (localized abnormal accumulation of blood under the skin) at the site of puncture for drawing blood. The three different measurements described here may be used to diagnose diabetes (Table 1). How to Determine Blood (or Plasma) Glucose Levels? Measuring blood glucose concentrations is critical for diagnosis and monitoring of diabetes. This is usually done using a glucometer with test strips. A drop of blood is placed on the glucose test strip and exposed to a fixed quantity of an enzyme, glucose oxidase (shown in Figure 1), for a finite period of time. 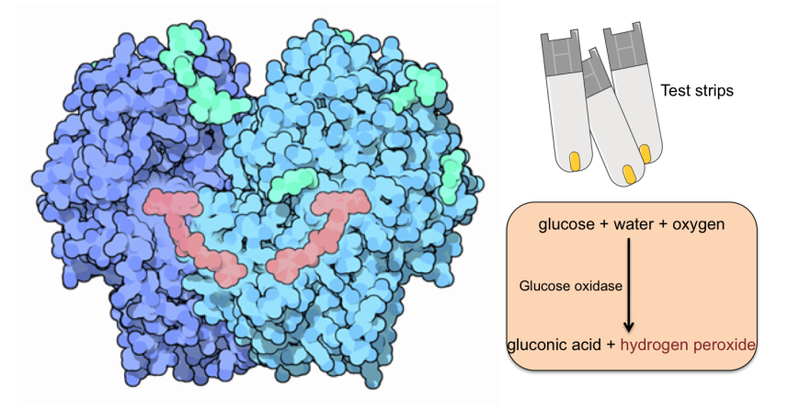 Glucose oxidase acts as a biosensor and oxidizes glucose to generate products (gluconic acid and hydrogen peroxide). In older models, the amount of hydrogen produced was measured by a color change reaction to indicate the glucose concentration. In modern glucometers, the hydrogen peroxide interacts with a mediator to transfer electrons to a microcircuitry included in the test strip to give a reading of blood glucose concentration. In order to get consistent glucometer readings, the test strips should be stored away from moisture and extremes of temperature so that the glucose oxidase coated on the test-strip is not denatured and rendered non-functional. Figure 1: The structure of glucose oxidase (PDB ID 1gpe) is shown here with Flavin Adenine Dinucleotide (FAD, colored red). Image adapted from (from http://pdb101.rcsb.org/motm/77). The chemical reaction used for sensing glucose levels using the diabetes test strips is also shown. Hemoglobin is a protein found within red blood cells that transports oxygen throughout the body. Prolonged exposure to high levels of glucose leads to glycation of proteins that are exposed to blood. Red Blood Cells (or RBCs) have a 3-4 month life-span thus measuring the level of glycation of hemoglobin reflects an individual's average blood glucose control for the past 2 to 3 months. High percentage of A1c reflects poor control of blood glucose levels over the past few months. N.B. : Conditions that change the half life of red blood cells such as many anemias (including that resulting from sickle cell disease) or thalassemias can confound the test. Typically the Hb A1c molecule is glycated on the amino group at the N-terminus of the β-chain of hemoglobin. Amino groups at other locations such as Lysine residues may also occur. 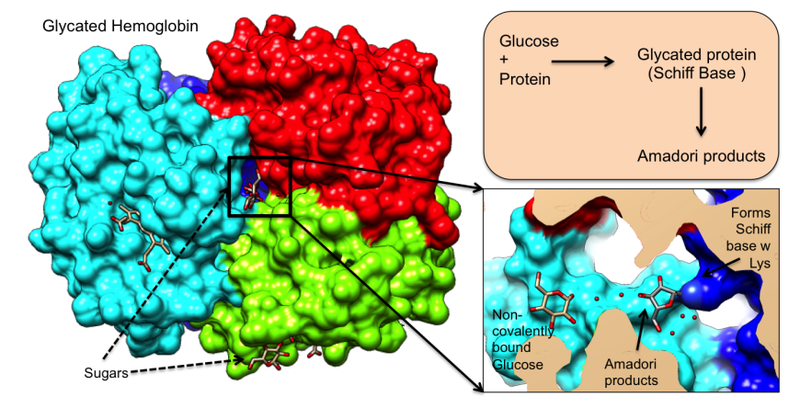 An example of the hemoglobin glycation is shown in Figure 2, wherein the glucose covalently binds to Lysine side chains and undergoes isomerization. Other proteins also undergo glycation and form advanced glycation products. Figure 2: Glycated hemoglobin (PDB ID 3b75) and a close-up of the modified amino acid Lysine 99 in one of the hemoglobin α chains.